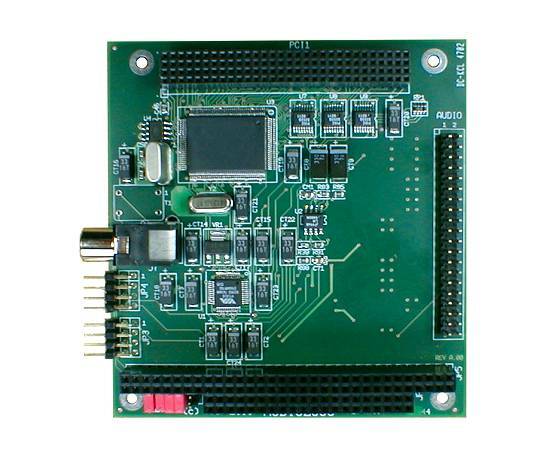 The Audio2000 Sound Card is a versatile and high performance 18-bit Sound Card that brings state-of-the art Sound processing to the PC/104-Plus architecture. The Audio2000 provides 6 Output Channels and 2 Input Channels simultaneously. All Audio paths are 18-bits wide which, with up to 48KHz sampling rate makes the Audio2000 an ideal solution for high performance embedded Audio and Multimedia applications. The built-in 18-bit sigma-delta Audio Codec conforms to the AC97 rev 2.2 specifications and features flexible sample rate adjustments down to 1 Hz resolution. A transformer-coupled serial S/PDIF output is also available as an option for Stereo Digital Output. The Audio2000 is supported by a suite of drivers for DOS, Windows95/98/NT/2000/XP and Linux.